I finally managed to make some turnout operating units (TOUs) for Junction Dock, and all the switches are now switching. The whole process was really a massive pain, but I’ve ended up with an implementation I’m happy with. My original idea had been to use wire-in-tube to operate the points, but moving the layout operation to the front meant I didn’t have a good location for the lever frame. So I ummed-and-ahhed, and decided to go with rod operation under baseboard and out the front panel. As I’d never really planned to install much under the board, not much (i.e. no) thought had gone into the placement of the structural members; which in turn means I had a rather constricted space to build the TOUs in. In the end, I came up with a design which is ~50x50x10mm, and provides a nice ~8:1 gearing between the push/pull rod and the switch. After much searching, I found some rather attractive concepts, made mainly out of plasticard, on the scalefour forum, here; https://www.scalefou…0&t=425&p=13048 . My first incarnation (no photos I’m afraid) was very similar to the linked version, but I used an external crank to provide the gear reduction. This worked well, but didn’t fit! So I had to change the concept to an internal lever. This is held by an 8BA screw on one side (left), pivots on a 1/16th brass tube in the driven arm (which in turn holds the connection to the tie-bar itself), and then held by another 8BA in the driving arm (right). The ratio between the hole distances provides the gearing. A microswitch provides polarity switching. The image below probably explains it better than the text. This is an early incarnation and further improvements were made, but this is the best photo I have. The whole shebang is mounted on a piece of 20thou plasticard (40-60thou would be better, but that’s what I had), which in turn is mounted on a sheet of ply (to make sure the mounting screws don’t come through the top of the baseboard!). The two sliding arms are built from evergreen plastic, 1/4 rod telescoping inside a 5/16th tube, from memory. I drilled a 1/16th hole through the middle of one rod to take a piece of brass tube of, I think, 1/16th OD (cemented into the plastic for security). This brass tube holds a telescoping piece of tube (3/64th? ), which connects up to the point tie-bar (as my track is inset, I use full moving PCB tie bars). Mark 3 shows the slotted tie bar, and a change to the drive connector to bring the drive rod up to the right height for the baseboard. This reused the drive bar from mark 1, hence the redundant brass tubes (in theory set to the gauge of the point blades, and designed to allow the blades to be driven directly without the use of a functional tie-bar “up top”). Connection to the drive rod is via a stripped down chocolate block connector. Mark 4 made some further rationalization of the design. 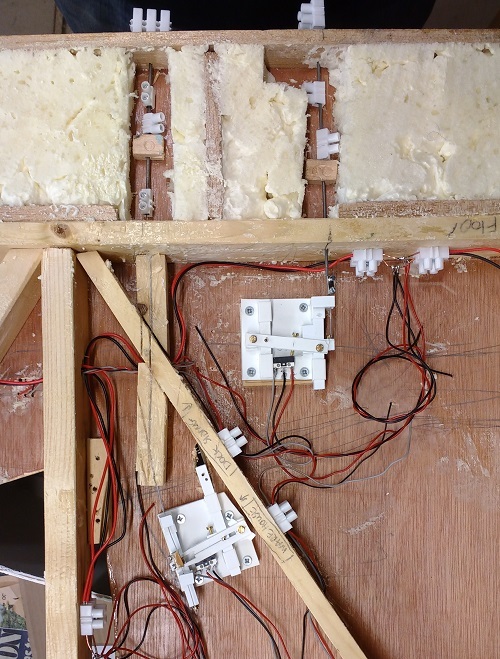 Below is an image of two of the units installed under the baseboard. The drive rods come through to the front of the layout. 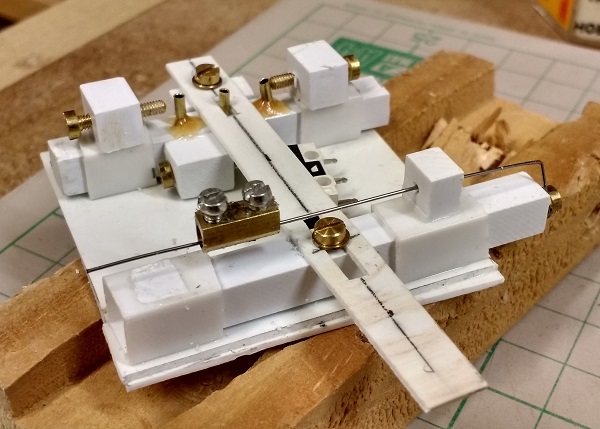 I decided to put the motion limits on the drive rods themselves, and that is simply done by adjusting a pair of chocolate block connectors against front and rear wooden stops. The TOU in the lower left of the picture is at an angle to the board, and in a really awkward position; so I used a bit of wire-in-tube to transfer the rod motion to the TOU. 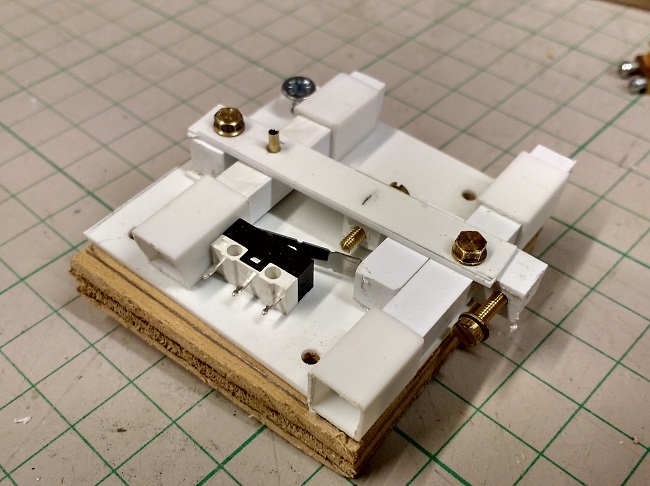 This is also a bit of a “special” unit, to account for the baseboard (in)design — it has the connection to the point outside the bearings for the arm. I finished these a few weeks ago, but haven’t had time to post anything. 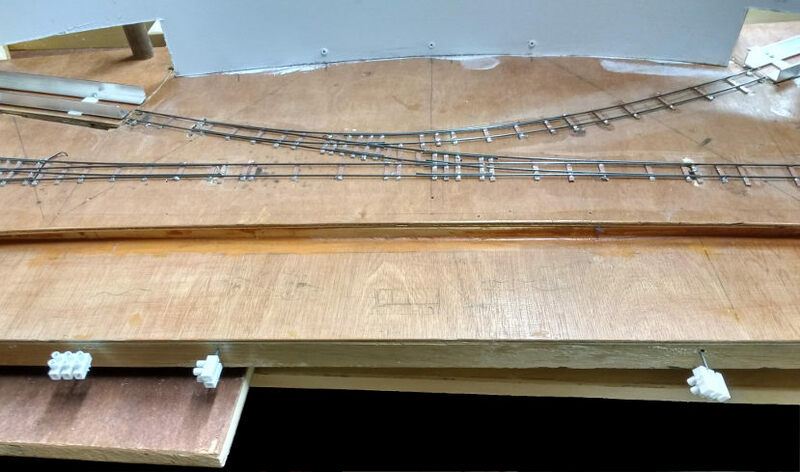 The layout is now fully wired (v simple – single engine in steam policy…), tested, and sprayed with primer. Next stage is I think getting some building frames in position so that I can start with DAStarding setts. Control rods coming through the front of the layout, with temporary chocolate-block handles! Mark 4 TOU assembled, from the guts of “mark 2” — hence the now redunant connections for individual blades on the point slide bar (far side). Two TOUs installed under the board. Upper one is controlled directly from the control bar. The lower one uses wire-in-tube to reach the correct angle and position. Mark 3 turnout part assembled. Control wire is attached to the right hand slide bar, and the point connected to the left hand bar.